Be sure to read the article titled, "Resident Autonomy in the Operating Room: Expectations Versus Reality" and "Teaching operative cardiac surgery in the era of increasing patient complexity: Can it still be done?" 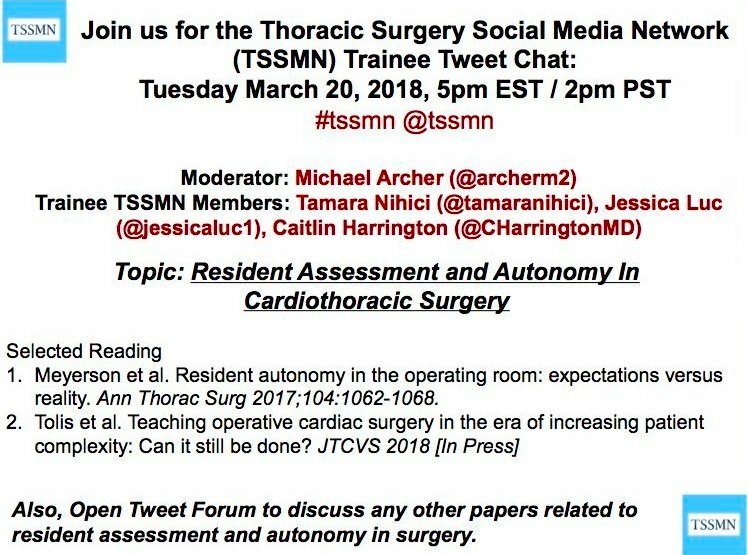 It's great to see trainees leveraging social media to discuss important issues that need to be discussed openly. 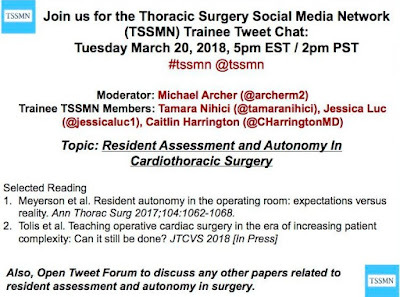 You can read more about the spirit of #TSSMN in this article, titled "Thoracic Surgery Social Media Network: Bringing thoracic surgery scholarship to Twitter." Here is one of the biggest announcements that came out of HIMSS 2018: the MyHealthEData Initiative launched by CMS. MyHealthEData aims to empower patients by ensuring that they control their healthcare data and can decide how their data is going to be used, all while keeping that information safe and secure. The overall government-wide initiative is led by the White House Office of American Innovation with participation from the U.S. Department of Health and Human Services (HHS) – including its Centers for Medicare & Medicaid Services (CMS), Office of the National Coordinator for Health Information Technology (ONC), and National Institutes of Health (NIH) – as well as the U.S. Department of Veterans Affairs (VA). MyHealthEData will help to break down the barriers that prevent patients from having electronic access and true control of their own health records from the device or application of their choice. This effort will approach the issue of healthcare data from the patient’s perspective. Medicare’s Blue Button 2.0 is a new and secure way for Medicare beneficiaries to access and share their personal health data in a universal digital format. Medicare’s Blue Button 2.0 will allow a patient to access and share their healthcare information, previous prescriptions, treatments, and procedures with a new doctor which can lead to less duplication in testing and provide continuity of care. You can also read the remarks made by CMS Administrator Seema Verma at HIMSS 2018. Advances in technology are leading to a host of innovations around reducing and detecting concussions. Today, the FDA authorized the marketing of the first blood test to evaluate mild traumatic brain injury (mTBI), commonly referred to as concussion, in adults. The FDA reviewed and authorized for marketing the Banyan Brain Trauma Indicator in fewer than 6 months as part of its Breakthrough Devices Program.